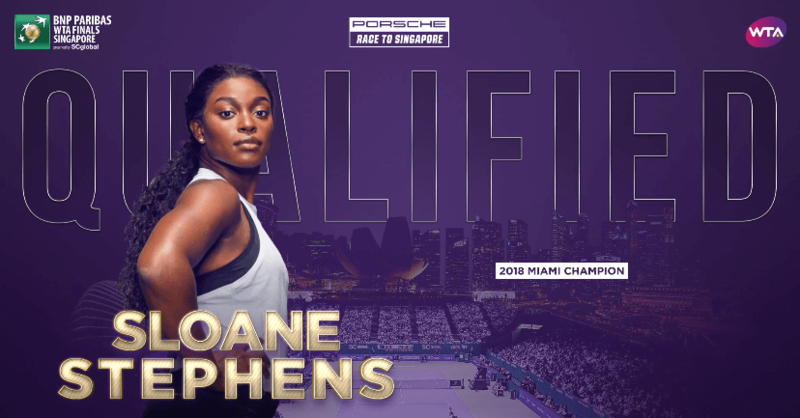 The field is set for the Sunday start of the WTA Finals in Singapore, where 25-year-old American Sloane Stephens will make her debut in the elite eight at the year-end event. World No. 1 Simona Halep dropped out on Thursday citing a herniated disk in her lower back. “Unfortunately, after much discussion with my team and doctors, I have made the decision to withdraw,” Halep said. “I wanted to finish 2018 on a high after such an incredible year, but sadly my back injury hasn’t healed the way we hoped it would and I need to put my long-term health first.” Dutchwoman Kiki Bertens replaces Halep. Also in the field are Angelique Kerber, Naomi Osaka, Petra Kvitova, Caroline Wozniacki, Karolina Pliskova and Elina Svitolina, competing for $7 million in prize money. Osaka along with Stephens will be making her year-end championships debut. Staged at the Singapore Sports Hub from Oct. 21-28, the 2018 BNP Paribas WTA Finals Singapore presented by SC Global is a 10-day tennis festival where the year-end Top 8 compete in a round-robin format, with the top four players moving into the single-elimination semifinals. 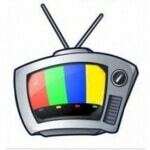 For more info go to www.wtatennis.com. The minor leagues of professional tennis will look very different, and the tours hope more lucrative for players, in 2019. To make it easier for prospective pros to make a living, and to hopefully curtail the rising tide of betting-related integrity issues, the ITF, ATP, WTA, USTA and other nation tennis associations banded together to create an ITF Transition Tour for juniors and college players looking to break into pro tennis. To make it easier for current pros in the minor leagues, all ATP Challengers will have a draw size of 48 and offer hospitality (hotels). For ITF/USTA Pro Circuit events, $15K events will only offer ITF Ranking Points, and men’s $25K events will offer ATP points only in the final round. Women’s $15K events will be part of the ITF Transition Tour with no WTA points. WTA ranking points will be awarded at $25K events and above. It’s a lot to unpack, but the end result will hopefully be an easier path to the pros, and less players forced out by the prohibitive cost of chasing ranking points around the world. “[It] will help address the issues of transition between the junior and senior game, and enable more professional players to make a living,” ITF President David Haggerty said. “The introduction of the transition tour will allow players to take the first steps towards becoming a future champion within a more targeted and affordable circuit structure.” To learn more go to www.playerdevelopment.usta.com/competitivepathway. Know a kid or young adult that looks like Serena Williams? Beginning today is casting in Miami for a major commercial for three roles — Serena at 7-13 years old, at 15-19, and at 22-27. Those auditioning must be proficient tennis players and must look like Serena. For more info email christine@universalcast.com…USTA Florida needs just a few more tennis advocates to sign-up with the Round Up donation app so Florida can hit the mark to receive 75 racquets and 180 balls for kids’ programs in need — you can help by signing up here before 5 p.m. today…In USTA Player Development news, former Head of Women’s Tennis Ola Malmqvist was promoted to be its new Director of Coaching, a position previously held by Jose Higueras, while former Team USA Lead National Coach Kathy Rinaldi and Director of Player ID and Development Kent Kinnear were promoted to heads of women’s and men’s tennis…Tonight from 5-9 p.m. is Oktoberfest at the USTA National Campus, featuring tennis, German food, beer and music…Over the weekend Simona Halep secured the WTA year-end No. 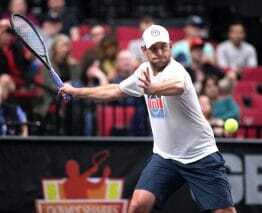 1 ranking for the second year in a row…Forbes takes an interesting look at how Andy Roddick has built his post-playing fortune through patient real estate deals and investments…If the WTA tour had an under-21 Next Gen Finals similar to the ATP at year-end, Florida teens Sofia Kenin and Amanda Anisimova would qualify among the Top 8…Nick Kyrgios has ended his season early due to an elbow injury…Wimbledon says it will introduce tiebreaks at 12-12 in the fifth set beginning in 2019…Caroline Wozniacki just signed a deal to — launch her own crypto token?…Andy Murray made the day of some ladies celebrating a birthday with tennis in Philadelphia, and got some pumpkin break out of it…Florida USTA League teams are mopping-up at USTA League Nationals, including a national championship-winning effort last weekend. John Isner, playing his first tournament as a father, slammed 31 aces on Thursday to move into the quarterfinals at the Intrum Stockholm Open, defeating fellow American Bradley Klahn 7-6(2), 6-7(5), 7-6(5). The 33-year-old No. 1 seed in the quarters will face 27-year-old American qualifier Tennys Sandgren, who defeated German Oscar Otte 7-6(4), 3-6, 6-3. No. 4 seed Jack Sock moved into the Stockholm quarterfinals on Wednesday when he outlasted Swedish wild card Mikael Ymer 7-5, 3-6, 6-3. 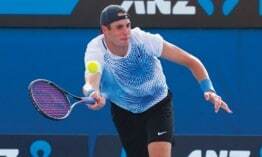 Sock in the Friday quarterfinals will meet qualifier Ernests Gulbis. On Wednesday at the VTB Kremlin Cup the last American exited when Tunesia’s unseeded Ons Jabeur defeated No. 3 seed Sloane Stephens 6-3, 6-2. Also on Wednesday Mackenzie McDonald was the last American out of the European Open in Antwerp, Belgium, when he lost 6-1, 6-1 to No. 5 seed Gilles Simon of France. See below for Friday quarterfinal tennis coverage on Tennis Channel and beIN Sports.